After fitting Toile No. 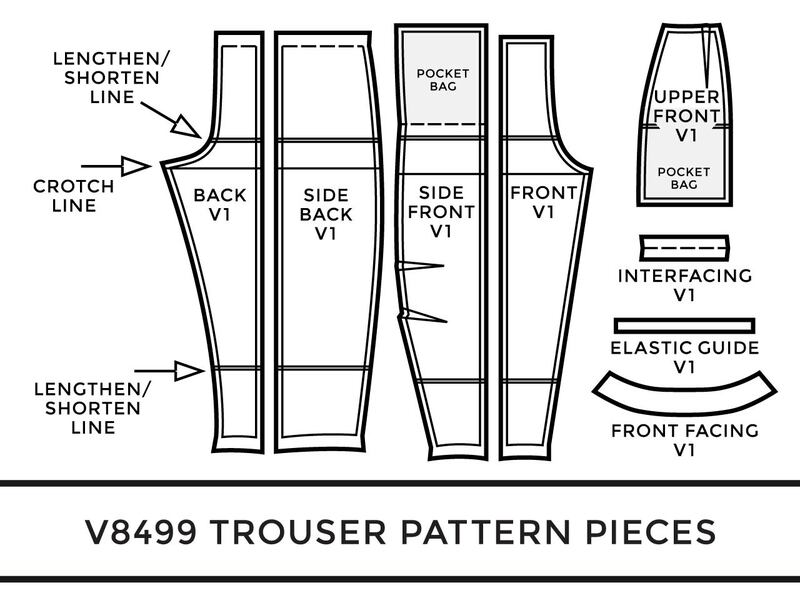 1 of the V8499 trousers from Vogue Patterns, we can now translate these fit changes into pattern alterations. 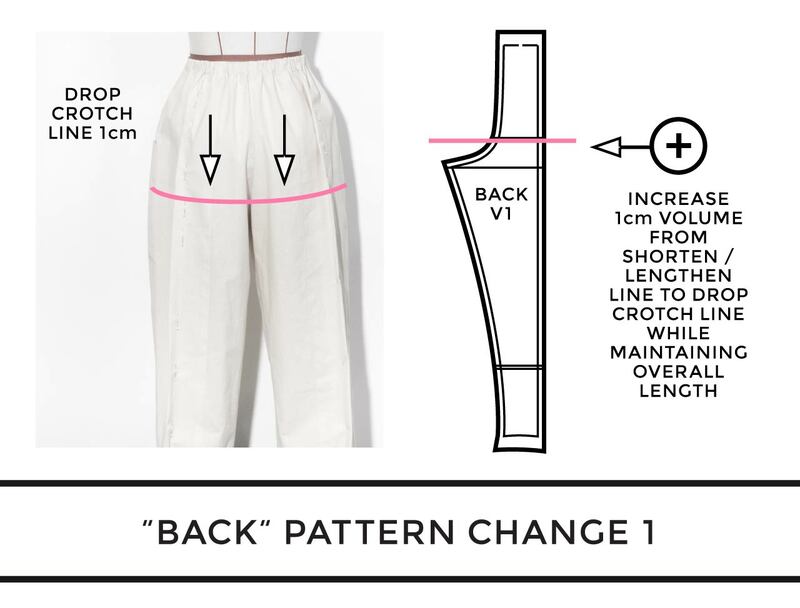 As mentioned in the previous posts these fit changes are designed to refine the amount of excess volume in the hips of the trousers while still maintaining the nice curve and use of volume through the legs. You can view more images and notes for Toile No. 1 in the post Pattern and Toile No. 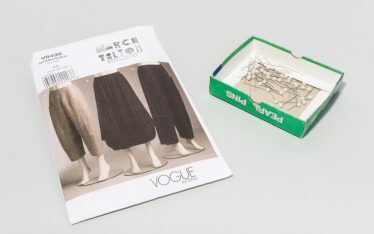 1: V8499 Trousers from Vogue Patterns. 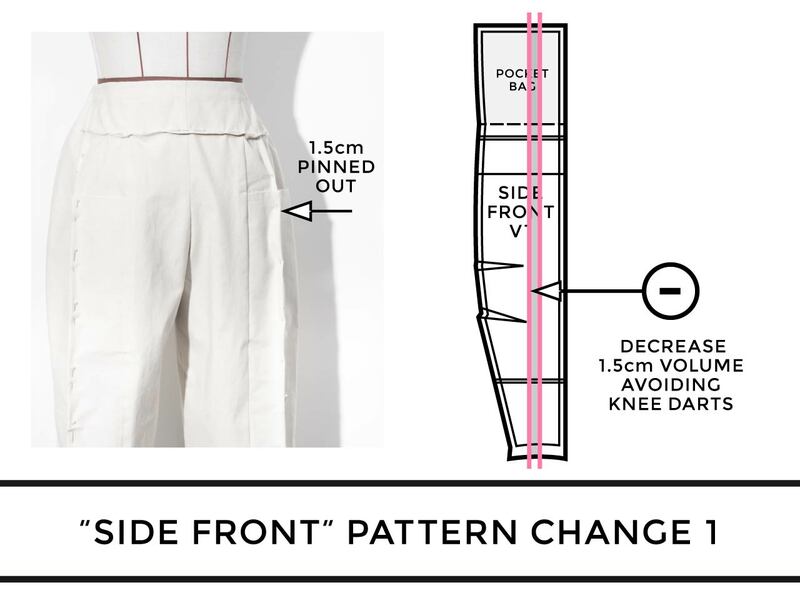 The fit changes that we made can be viewed in the post Fitting Notes Toile No. 1: V8499 Trousers from Vogue Patterns. When you’ve made a list of all the changes that you need to make to a pattern it can be quite confusing. How do you make sure you apply the pattern changes to each piece? How do you know when to use a cut and spread approach vs. a pivot method approach. For this pattern, a combination of methods were used depending on the complexity of the pattern alteration needed for each pattern piece. In general, it is always good practice to create a new and separate version of the pattern so that you can clearly compare version 1 to version 2 at the end of your changes. If you cut and change your original pattern then it can be easy to get lost – and then you don’t have anything to compare back to. 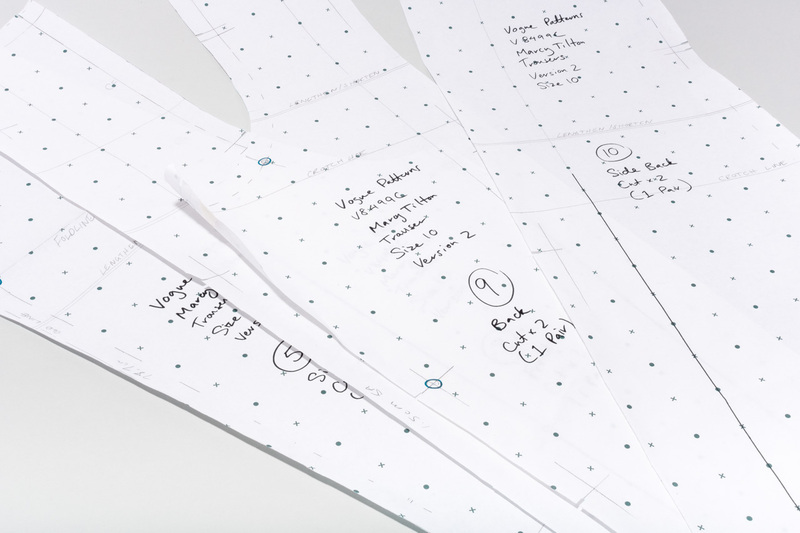 This diagram shows the original pattern pieces that were used to create Toile 1. The top of the “Side Front” piece folds down to create part of the pocket bag. 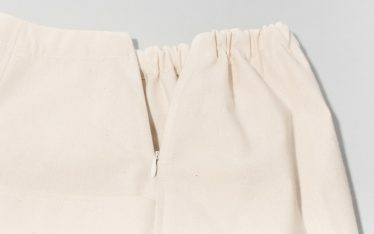 The back of the pocket bag is created by the “Front Upper” piece. The front of the waistband is finished with a front facing. The back waistband folds down to create a casing for the elasticated back waist. The first step is to identify the guidelines marked on the pattern that we will need to use. 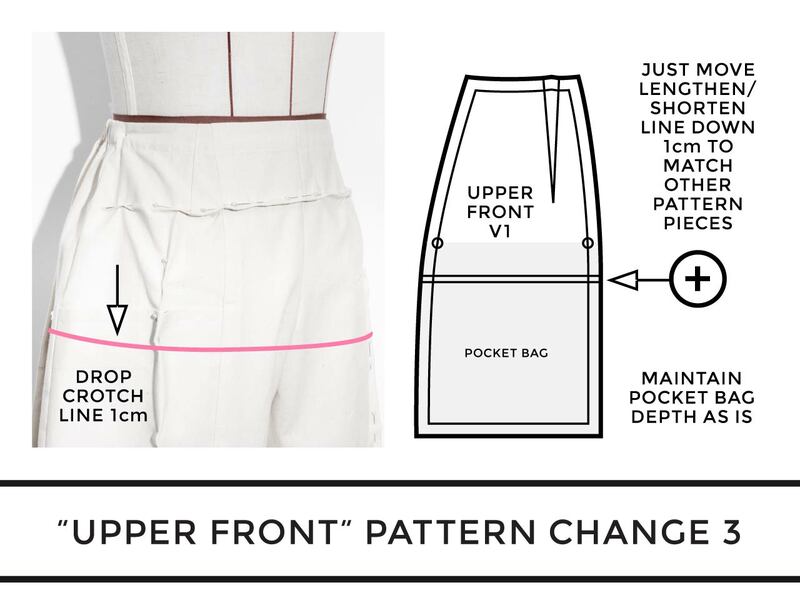 For example, we need to know where the crotch line is for some of the pattern changes. Plus, if you are working with a commercial pattern then it helps to identify the lengthen / shorten lines as they are generally marked in a consistent position on all pieces and can be used to your advantage. 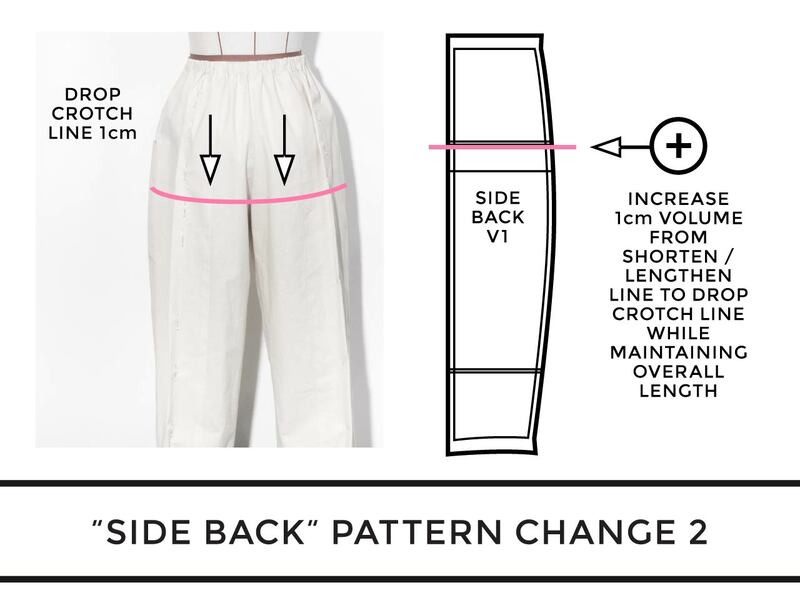 The following diagrams show the changes to the “Side Back” pattern piece. Decrease 4 cm volume out of the back leg, as it was pinned. Drop the crotch line by 1 cm to lengthen the distance between the waist and crotch line. Maintain the overall length of the pattern (until the hem can be adjusted on all pieces at once). These two pattern changes were made at the same time using the pivot method described in How Patterns Work. This essentially consists of sliding the existing pattern piece over a new sheet of paper to trace off different sections as needed. The 4 cm change is made by making a straight guideline vertically through the pattern piece in parallel to the grainline. The existing “Lengthen / Shorten” lines on the pattern were used as the guidelines to lower the crotch. We are effectively just shifting the middle section of the legs when making this change, as explained below. For these back pattern pieces that we are changing, we need to make decisions here that will also apply to the front pieces. The aim of the length change is to add in an extra 1 cm of volume along the existing “Lengthen / Shorten” line, and this will push everything below that down by 1 cm. This adds extra length through the lower body, which also lowers the crotch line as needed. However, we don’t actually want the whole legs to be longer, so it is just the middle sections of the legs that need to be shifted and traced while the overall leg length stays the same. Take out 8mm of volume horizontally. It sometimes happens in fitting that you will have two seemingly contradictory pattern changes, but they don’t necessarily cancel each other out. It can be important to consider these changes carefully; overall the pattern may not be changing much, but you may still need to shift notches and other guidelines so that they match up correctly with any adjacent pattern pieces. 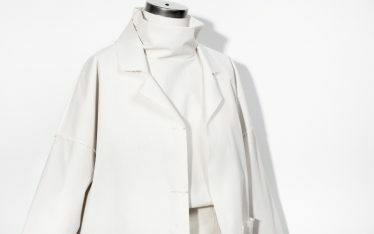 In this case, these pattern alterations are a result of changing the balance of the pattern between the front and back. Overall, only a tiny length change of 2 mm is actually taking place horizontally at the centre front area. However, depending on where you place your guidelines for this change it may have an effect on the position of the notches along the crotch curve, and on where the notches need to move so that they match up with the “Side Front” piece. Decrease 1.5 cm volume out of the front leg, as it was pinned. As with the back pattern pieces, these changes were made using the pivot method to slide and trace off a new copy of the “Side Front” pattern. Pay attention to the main pattern when making changes to this pattern piece and ignore the pocket bag. The pocket bag can be created again at the end when the piece is finished by folding the paper along the pocket foldline. One additional area to be aware of for this piece is the height of the knee darts which were in a good position on the first toile. In this case, when the middle of the leg is shifted down most of that section of the leg can be traced. However, the knee darts are traced while the pattern is back in the original position relative to the pocket foldline. This will ensure that the knee darts don’t get shifted down the leg. The lines can then be blended to create a smooth continuous pattern piece, and of course, you will need to be aware of the position of guidelines and notches on adjacent pattern pieces. It is the “Upper Front” pattern piece that has the largest combination of changes happening at once. 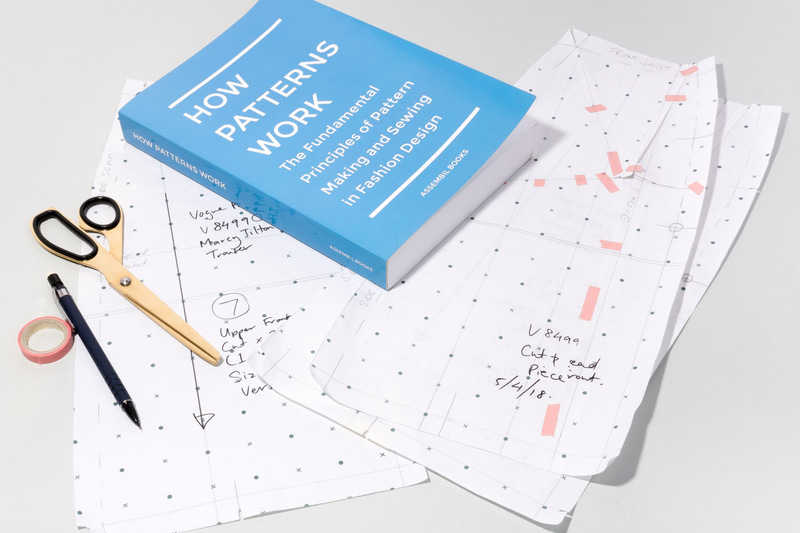 In this case, it is often easier to trace off an extra copy of the pattern to use with the cut and spread method as explained in How Patterns Work. 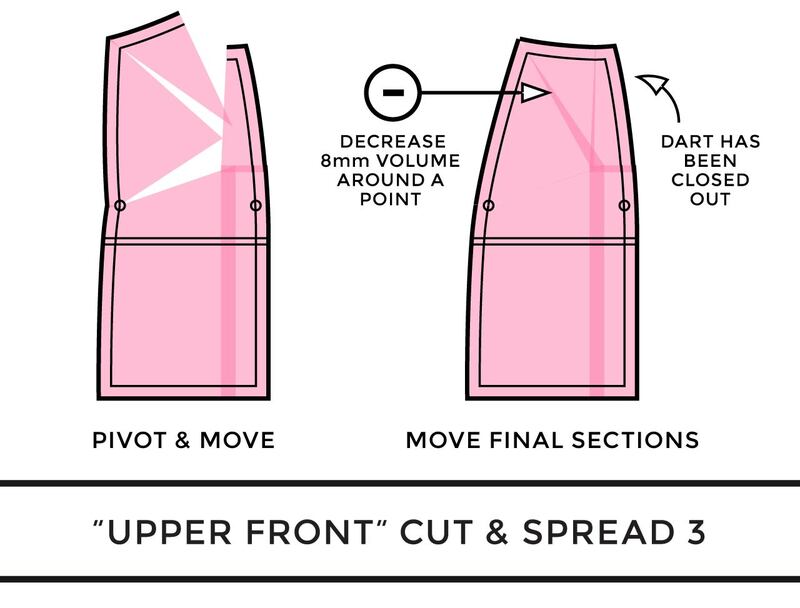 While it is often quicker to make simple changes using the pivot method, it is the cut and spread method that is the most visual and makes it easier for you to see where you have moved the volume around. Decrease 1.5 cm volume out of the front leg, as it was pinned. This was pinned out to come into line with the bottom of the front dart. As the front dart value is also 1.5 cm, can possibly also remove the dart. Take out 8mm of volume horizontally, tapering to nothing at the side seam. 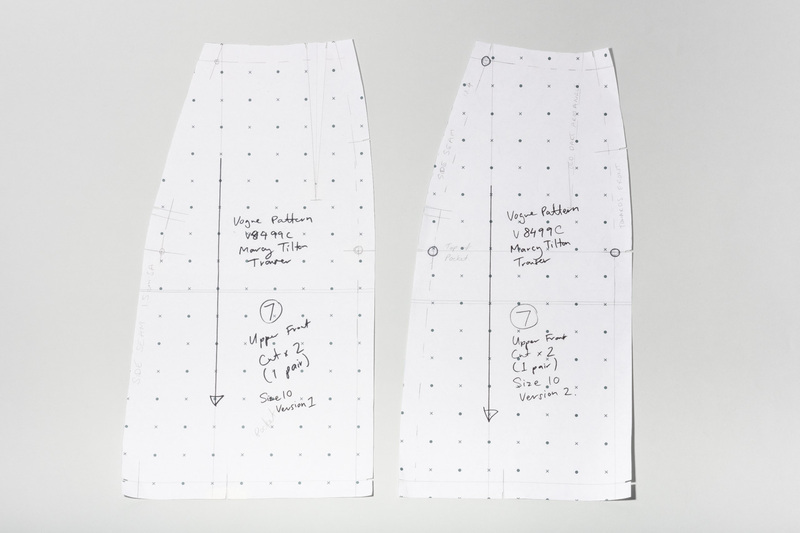 It’s important to remember when doing these sorts of changes, that darts (as with seam allowance) are not the actual areas of the garment that you are fitting. 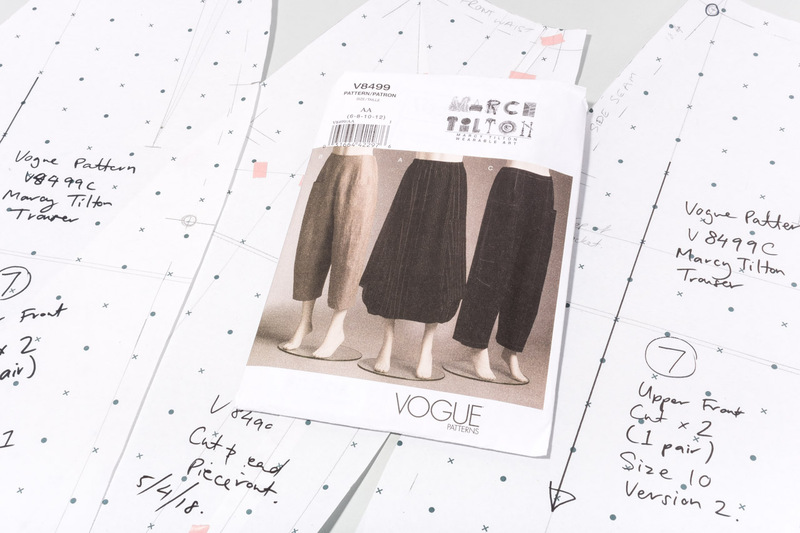 We often refer to these areas as construction space – these are areas outside of the stitching line and they aren’t actually part of the finished garment, they just allow you the space to sew everything together. 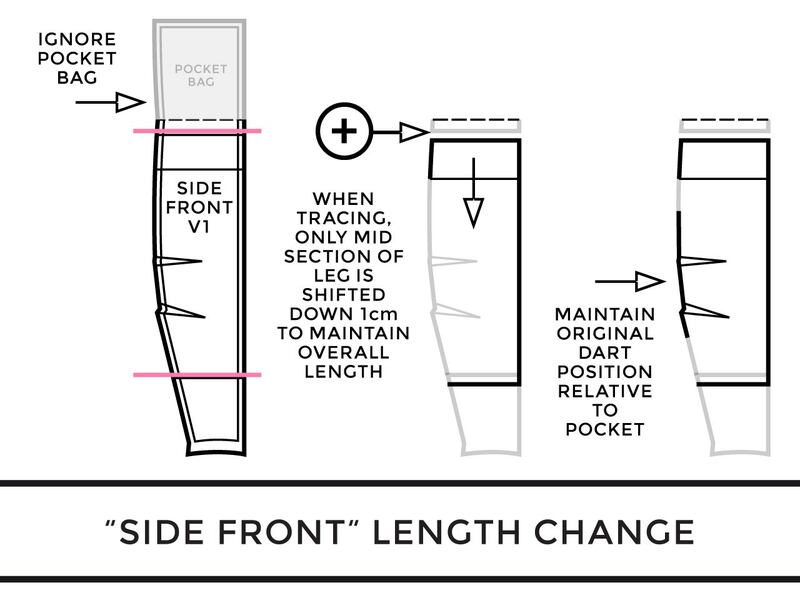 This is the reason why we can eliminate the front dart in this change – the dart and the 1.5 cm of volume that we pinned out through the front of the leg are basically doing the same job – taking volume out of the garment. So we can just think of that as one long rectangle of volume that can be removed from the garment, as shown in the diagram above. If you’re feeling nervous about removing a dart, think about where else there is shaping in the garment and consider if that is enough, and if it is in the right area. In this case, the fabric is narrowed between the hips and the waist through the curved front panel seams, and through the curved side seams. And in this case, for this mannequin and fit model, this works for the waist to hip measurement ratio. In a case where the waist is narrower, you may need to make the dart more pronounced instead. In the diagrams below we will explain in more detail how this change will be done at the same time as removing the dart and taking out 1.5 cm of volume through the front leg. 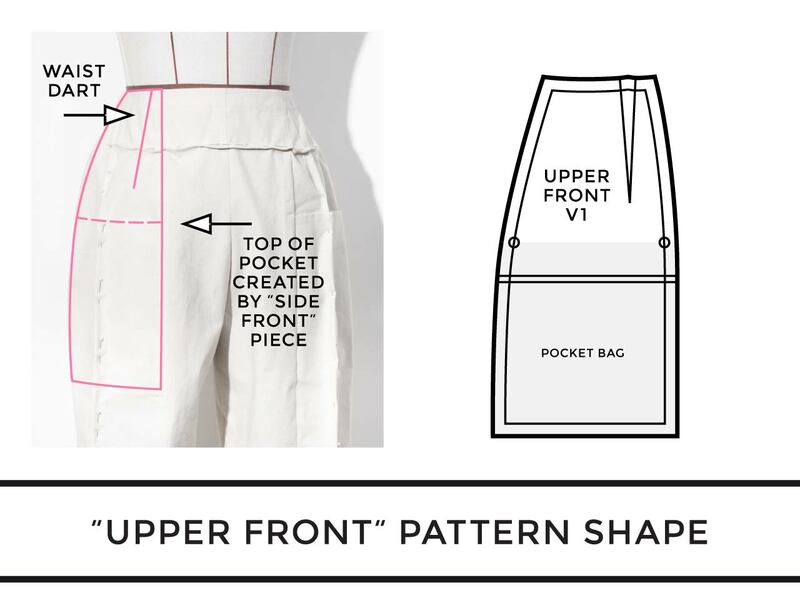 For this particular pattern piece, the crotch line isn’t actually an issue, and there is no reason for us to lengthen the depth of the pocket bag. 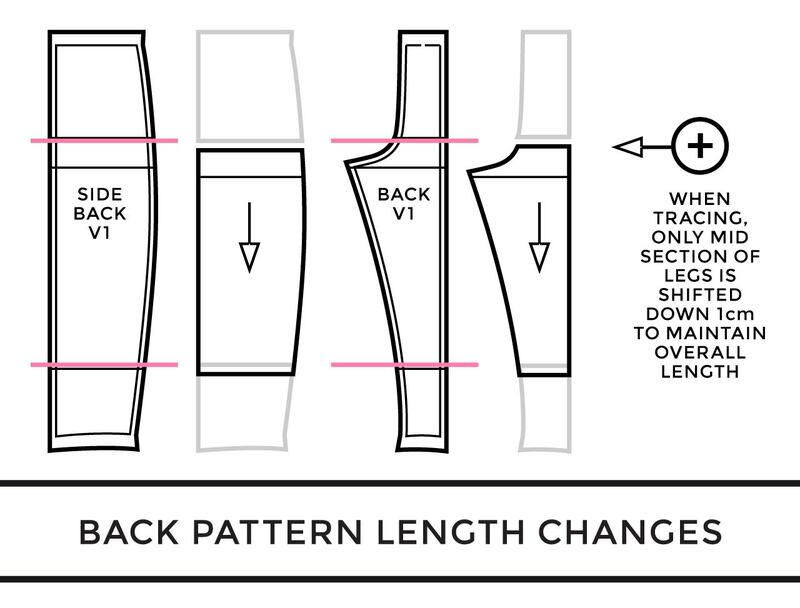 Instead, we just need to redraw the “Lengthen / Shorten” lines 1 cm lower on the finished pattern so that they match the adjacent pattern pieces. In these diagrams, you will see an overview of the pattern changes we are making using the cut and spread method. The first step is to always check and consider the changes you want to make and make a fresh copy of the pattern piece that you can cut into. You can then mark on guidelines for how you want to splice up the pattern. You should place your guidelines depending on which areas you want to preserve, and which ones you want to alter. In this case, we are actually going to hinge the pattern from the drillhole on the seam allowance (SA) at the side seam. On the original pattern, this drillhole marks the top of the pocket, so by hingeing from here we can keep the pocket shape as is, and also maintain the curve of the side seam. Once you have marked your guidelines, you can then cut into the paper and move all the elements separately. We’ve marked the dart value here in grey because it can just be removed completely. The best way to think about the diagrams above is to imagine that we are using sheer pink paper. Where the paper has been overlapped, the pink is darker. You can then position your pattern over a fresh piece of paper and move the pieces to create the new shape. In the diagram above you can see that the right side of the pattern has been moved to carry out two of the pattern changes: to take out 1.5 cm vertically, and to take out 8 mm horizontally. Mark guidelines on your paper as needed to keep everything square, and use tape to temporarily hold the pieces in position. These types of changes are simply even decreases in volume. 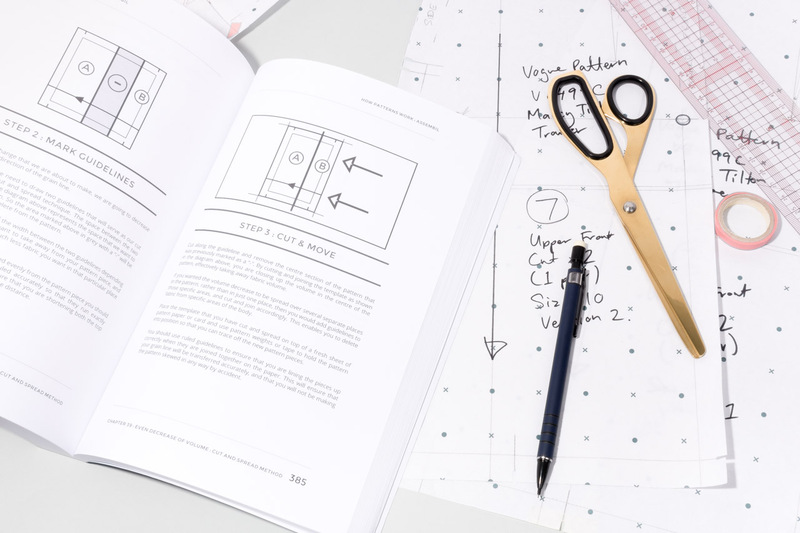 When you have the pieces hinged from the seam allowance as shown here, it means that you can move and manipulate the pieces to create your new shape. In this case, we need to move the loose sections at the top of the pattern and swing them into place so that we close out the old dart. Where the toile was pinned so that it tapered to the side seam, this means that you are decreasing the volume around a point. 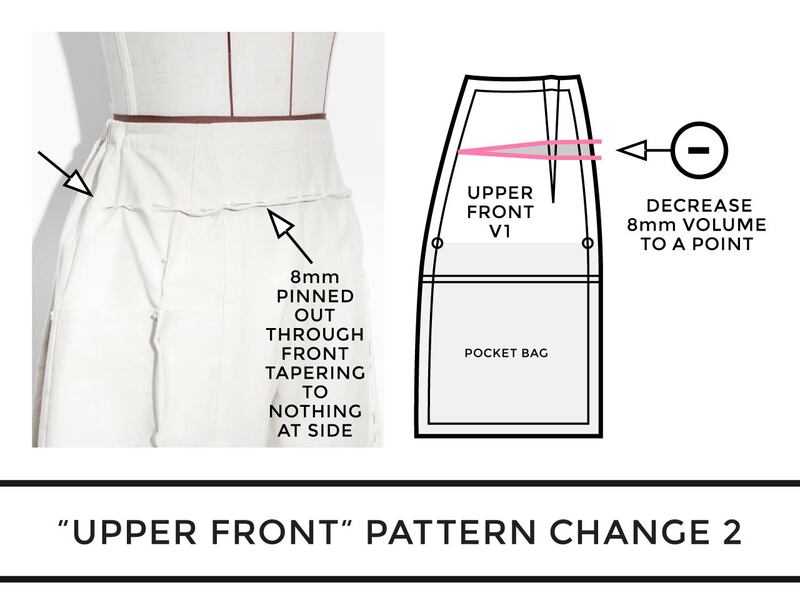 When this change is made in conjunction with all the others it moves slightly, but it is still in there – it is reflected on the cut and spread diagram above by the tapered section that angles up towards the top of the side seam. Once you are happy with the shape of the pattern you can trace all the details onto the paper to create the new version of the pattern piece. In this diagram and in the photo, you can see the finished pattern shapes side by side. For simplicity, we have kept all of the notches and the grainline out of the diagrams to allow you to concentrate on where the volume is being moved. But once the pattern has been traced, checked and blended you will need to ensure that all grainlines, notches and drillholes are marked and in the correct positions. When you are doing lots of changes to different pieces like this, don’t cut out the pattern pieces just yet. Get them all to a certain stage of being outlined and ready with all the details drawn, and then you can make all the finishing touches at once. Aligned and temporarily taped all the pieces at the hem. The hem could then be redrawn at a shorter length with a smooth continuous curve that blended across all the pieces. Check the flow through across all the pieces at the waistline. In this case, the back and front meet at the side seam at an angle. This usually isn’t ideal, but is a result of the design with the back waist casing and is best kept as is so that the back waist will fold along the cross grain. 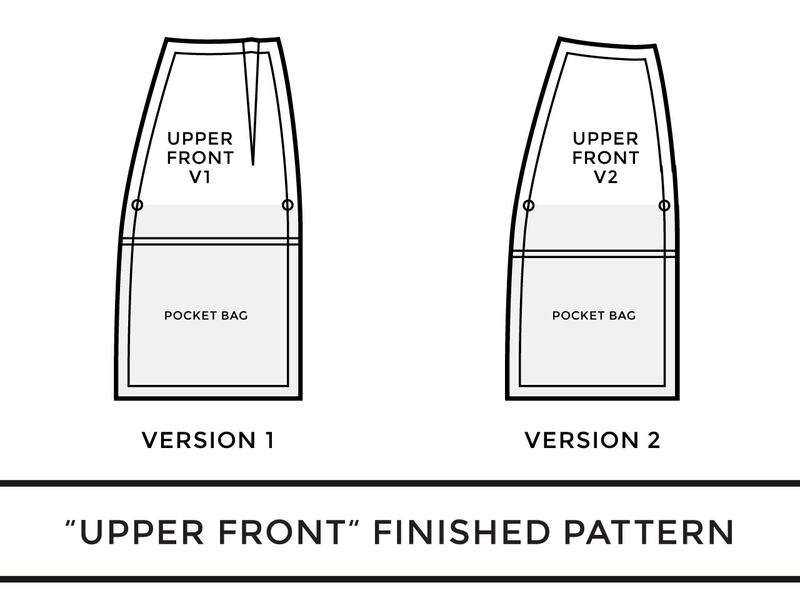 Check that the pocket bag shape is the same on both the “Side Front” and the “Upper Front”. You can trace one to the other to make them exact. Slightly taper out “Side Front” by 3 mm at the top of the pocket on the side seam. This is to make the “Side Front” slightly larger relative to the “Upper Front” pocket underneath and will encourage the folded edge of the pocket to have a little more breathing space and a nice curve. Check all the seams by “walking” one pattern against the other. 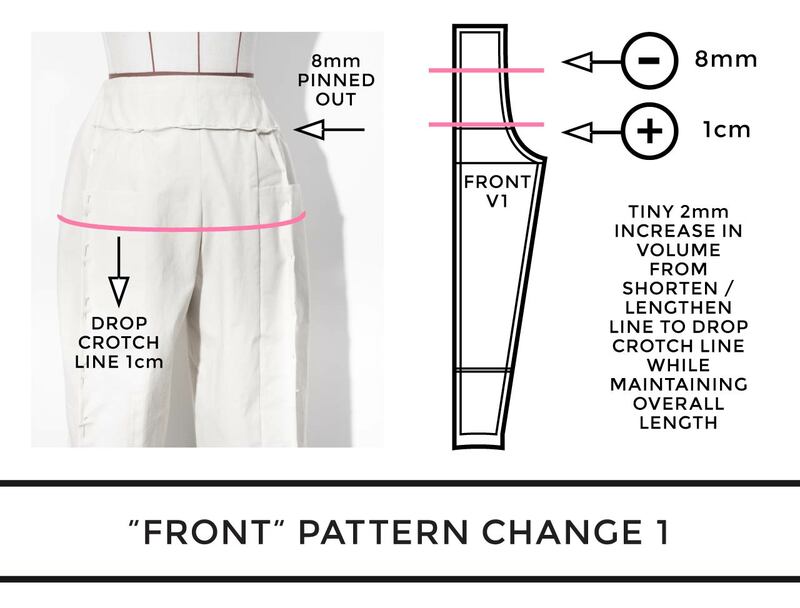 Below is a complete list of the fit and pattern changes that have been made. Due to the number of different fit changes, and because of the amount of volume taken out in some of these changes, we will then cut and sew a second toile. 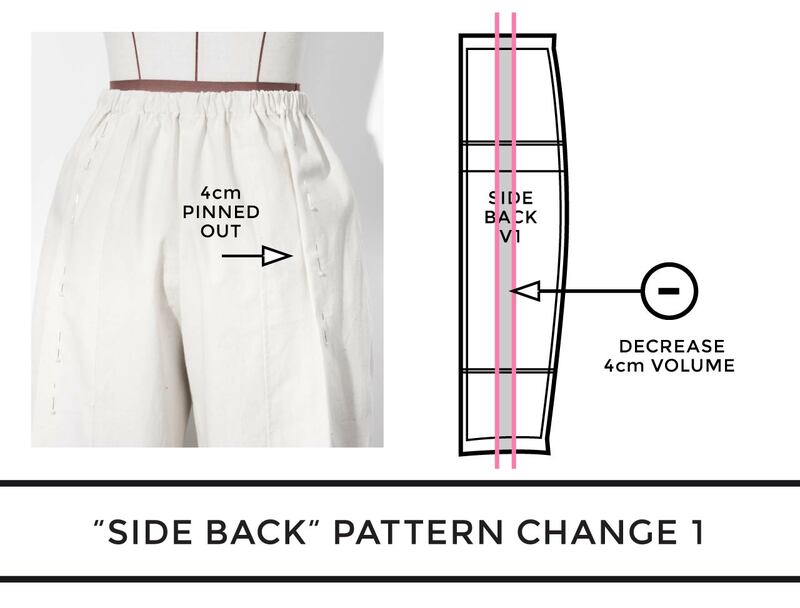 Take out 4cm vertically through “side back” pattern piece to reduce volume. Take out 1.5cm vertically through front panel (“front upper” and “side front”) to reduce volume. 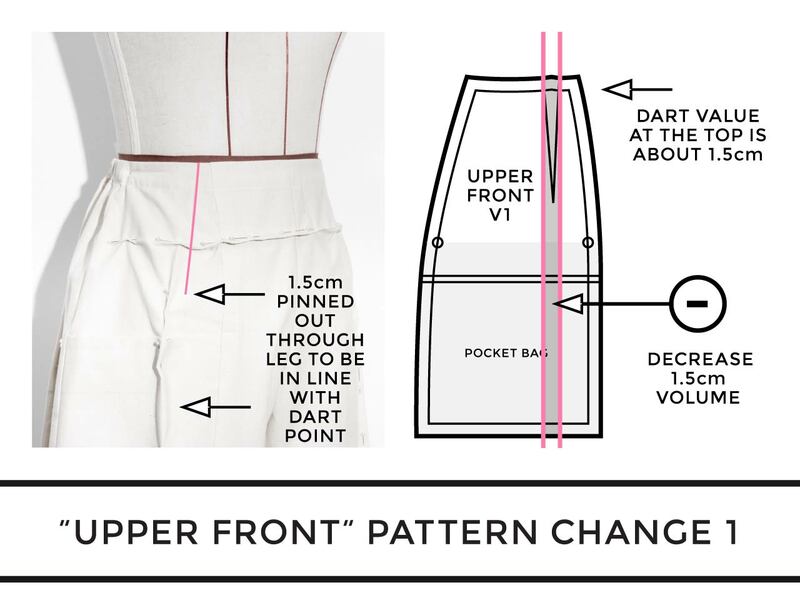 As the pinning for this change was only up to the level of the front dart point, as part of this change, move dart value or reduce curve of panel at front seam or at side seam or both. In the end on this change, the front dart was removed. Horizontally take out 8mm at CF panel “front”, blending to nothing at side seam. This is to reduce the fact that the front of the pants was sitting too high at the waistband. These changes were made through cut and spread. Update facing shape as needed to fit new front waist shape. Take 5mm off the bottom of the front facing SA for the pattern. Then you won’t need to trim off this amount in Step 19 of the instructions. Notch CF of facing pattern to help you line it up with the centre seam. 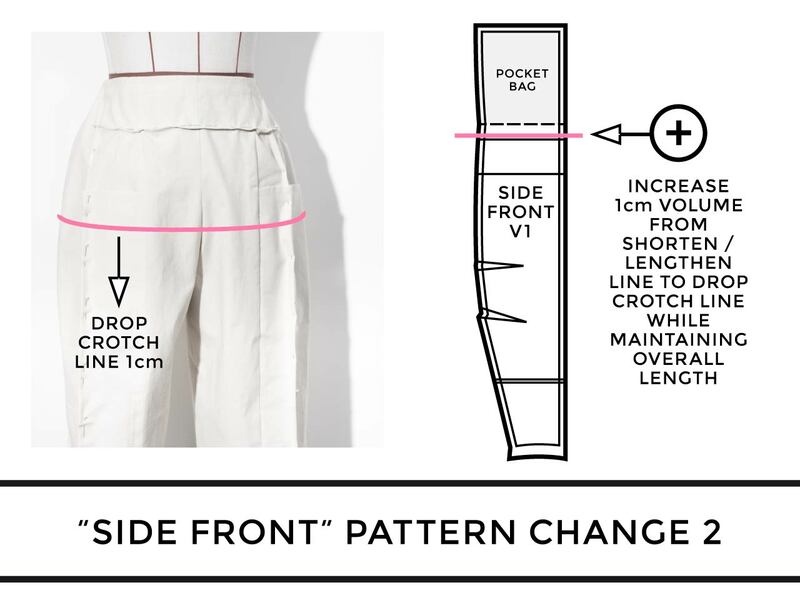 Add 1cm extra length horizontally through the body to lower crotch level. Compensate for this by raising legs by 1cm so that knee darts will remain at the same level. 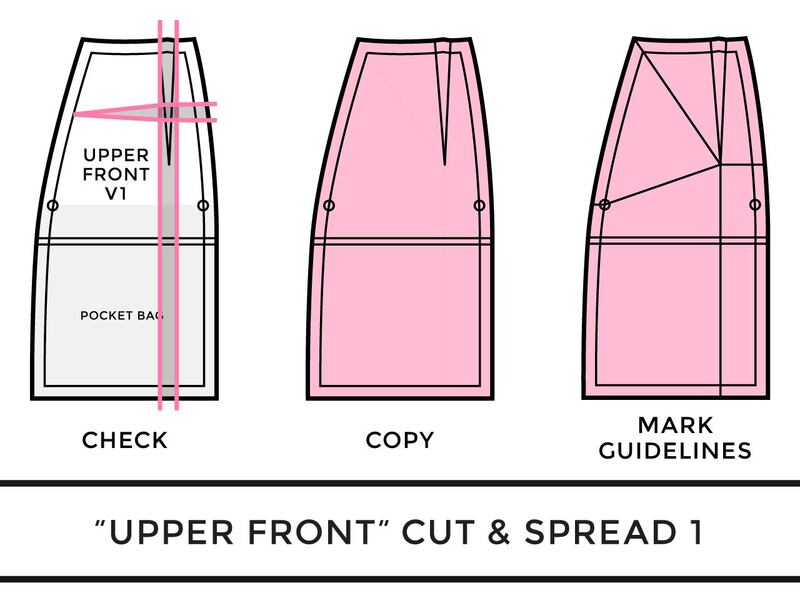 Applies to “side back”, “back”, “upper front” and “side front” pattern pieces. On the toile, the leg length was pinned at two different heights to test the desired length. 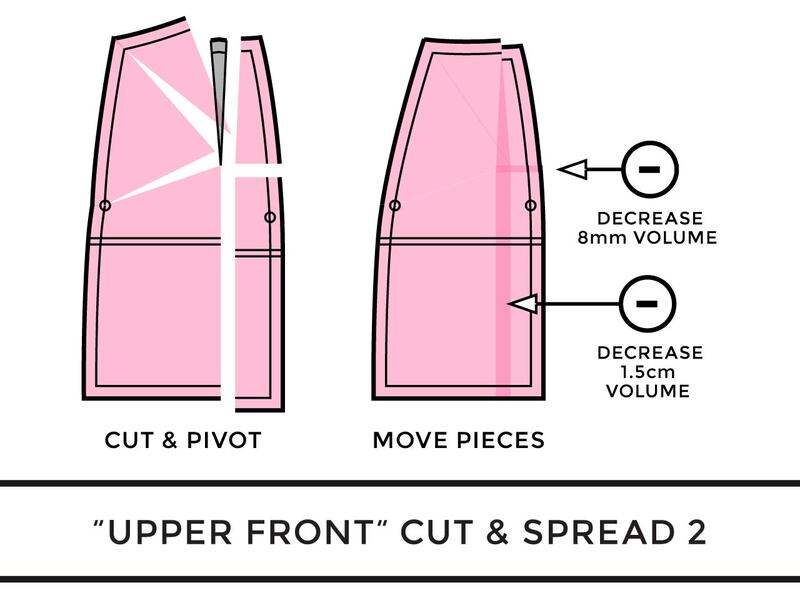 Alter leg length to create shorter hem height. 11.5 cm was taken off the hem of the trousers and then the hem line was blended across all pieces. Hem allowance was changed to 3.5 cm. This is to allow for an overlocked edge and then for the hem to be finished as a single turn hem, topstitched at 3 cm. Update shape of pattern piece as needed to fit new front pattern. Fusing piece is traced from updated pattern, and then 3mm taken off each edge to make it easier to fuse to fabric. This can be checked and adjusted on Toile No. 2.